My afterschool students have been practicing their lettering with acetate tracings, mounted to photo backgrounds. I had a range of kinder – 4th graders, and all were able to create and trace to their own ability. 1. 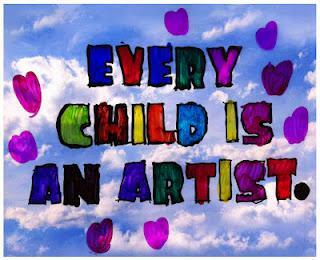 I printed out this quote “Every Child is an Artist’ using Fink Gothic typeface, graying the lines to make the tracing more readable. Students placed a sheet of acetate over it and traced the letters with a black permanent marker. 2. Some new Brush Tip Sharpie Markers were used to fill in the letters. They are my new favorite tool as they feel like paintbrushes and fill in solid color so smoothly. 3. The acetate was taped to a color print of clouds.